Opening the presentation, Edward Haslam gave an overview of the legacy of mining, and its environmental, economic and social impact. Haslam discussed the in-roads that have been made to date in improving the image of mining, as well as the next steps to encouraging trust. Sir Richard Shirreff was the next to speak, talking largely about Stategia’s role in working with clients to identify risk both above and below ground, and the interdependencies in collating a risk plan. A key message from his speech was the need for companies to be more proactive and less reactive – something he sees beginning to take place. Shirreff also utilised case studies as demonstration of times when risk plans weren’t in place, and the impact of that when risk ultimately occurred. 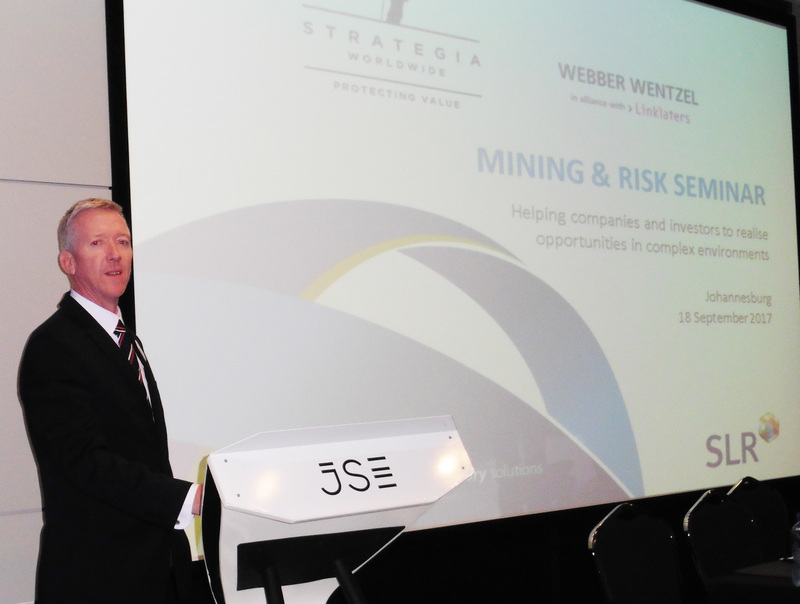 Wrapping up, Shirreff noted the number of risk factors involved in mining, be it economic, financial, cyber, country-based, and many more. Shirreff handed over to Dave Walker who delved deeper into risk profiles, relating these to specific projects and how these change as the projects progressed. Walker also identified the different kinds of risk, and which points in the project lifecycle create the greatest opportunities to influence risk. Discussing the top ten issues in mining, he concluded that the most important of these are social and environmental issues, using case study examples to support this point. Finally, Jonathan Veeran discussed mining specifically in relation to Africa, concentrating on the fact that Africa has over 30% of the global mine reserve, yet this has not translated into levels of development. He focussed on the improvements in this area, and the allowance for collaboration between government and the private sector – which he believes will be essential to the process. Veeran also shared that many African states have set up initiatives allowing more regulatory and financial control over the mining industry. To conclude, he highlighted the risk over overregulation, and how this can impact growth and sustainable development. After the speakers, the afternoon was concluded with a very conducive question and answer session, as well as a networking opportunity.